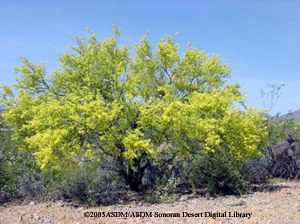 The Foothill Palo Verde (Parkinsonia microphylla) is sometimes called the littleleaf palo verde or the yellow palo verde. This is because is has very little leaves and when in blossom the flowers are bright yellow. The green branches are spine -tipped, stiff and upright giving the tree its name. Palo Verde is Spanish for green stick referring to the tree's green bark. The foothill species of palo verde requires less water than the blue palo verde. Because of this, it is found in the upland areas of the desert where the soil is more coarse. These trees occur thought out the Sonoran Desert except in the driest regions. The palo verde is doing well in its range. These trees can live to be more than 100 years old, possibly as old as 400 years. It is considered a large shrub or a small tree standing about 15 feet tall on average, occasionally reaching as tall as 30 feet. The palo verde is the primary nurse plant for young saguaro cactus. Humans have used the seeds of the palo verde for hundreds of years. Seri Indians eat the seeds fresh, toasted , or ground as flour. The Tohono O'odham prefer to eat the seeds fresh from the pods.